Podcasts are hot again! 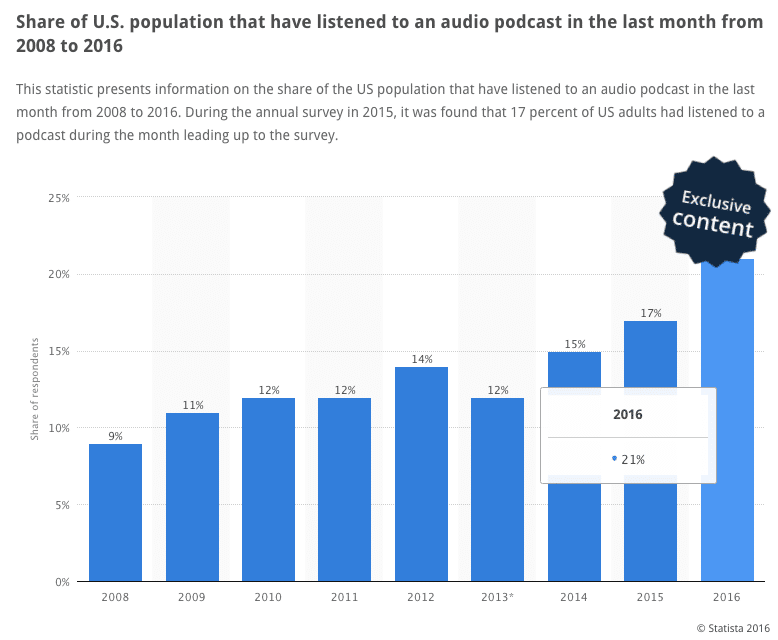 In 2016 podcast use is skyrocketing. 57 million or about 21% of those in the U.S. now listen to a podcast at least once a month. That’s about the same number as total active users on Twitter, and unlike Twitter, the podcast consumer base is up 23% from 2015. In the entrepreneurship world no podcast is hotter than Entrepreneur on Fire, hosted by John Lee Dumas. He has recorded 1,419 episodes as of this post, puts out a new episode EVERY DAY, and as a result he got 2,129,882 unique downloads in August, 2016, alone. You can see why aspiring influencers and entrepreneurs would like to get on EOFire as a guest. The kind of publicity John is giving away for free can bring instant notoriety. Maybe that’s why they receive over 300 requests to be on the show each month. Since my book Chief Marketing Officers at Work was published I’ve had podcasters reaching out to me to have me as a guest, and it has been a lot of fun. And of course it’s great for selling books and building my brand as an influencer. I enjoyed listening to EOFire before I was ever on a podcast, but the other day I was listening to Geeta Nadkarni’s Baby Got Booked podcast from 2015 where she interviews JLD and on it he explained how to get featured on his show and I thought “Hey, I could do this, why not?” That’s when I decided to reach out to EOFire to see what the process is for becoming a guest. Here are the steps. 2. Once you receive the application, fill it out. In the application John asks for standard stuff, like a bio. Here’s what I sent in (there’s a 50-word limit, I decided to push it to 51…we’ll see if I get the slapdown–John’s a military guy so he may not make any allowances). Speaker, writer, entrepreneur. Founded MWI, a digital marketing agency, in 1999. Clients include Sony, LG, Standard Life, Symantec. Author 200+ articles on Forbes, Mashable, Inc, Entrepreneur, TechCrunch, Time. Interviewed 30 CMOs from GE, Spotify, Target, PayPal, more, for book Chief Marketing Officers at Work. TEDx speaker. Ultra marathoner, skater, husband, dad. John also asks you to submit a 60-second video talking about an ah-ha moment in your business. Here’s mine. Then, John asks for a write up (100 words or more) of your worst experience as an entrepreneur and what you learned from it. This was tough for me because I’ve made a lot of mistakes, but it wasn’t too hard to pick out the worst time period of my entrepreneurial career and talk about that. In 2007 I hit rock bottom as an entrepreneur, and in every other area of my life. I hadn’t paid myself a dime in four years, I had hundreds of thousands of dollars in debt, my business was in worse and worse shape each month, I was eating junk food nonstop, I was fat, I was depressed, I was a poor excuse for a husband, etc. I had a vision and I was able to recruit great people, but when it came to running a business it seemed like everything I touched failed. I watched other people doing what I was doing and success seemed to come so easily to them, and I couldn’t figure out what I was doing wrong. I took a step back, looked at my life, and asked myself “What is one thing I am doing wrong today that I could do right tomorrow that is 100% in my control?” and there was an obvious answer–stop eating junk food and start exercising. And that’s what I did. I got to the gym and started watching what I ate. Within 18 months I lost 50 lbs and despite never running over a mile in my life, I had run a marathon and competed in a half-Ironman race. I had also paid off $150K in debt and was earning a steady paycheck from my business. Was there a connection between my physical health and the health of my business? Absolutely. If you’re slacking in one area of your life it will pull you down in every other area. Happily, the opposite is true–if you achieve excellence in one part of your life, you won’t tolerate anything but excellence in every other part. There were some other minor things to check off on the app, but these three parts were the bulk of it. On to the next steps. 3. Click submit, cross fingers. Now here’s the thing–EOFire warns you that it can take two months for you to get scheduled to be on the show, and another two months after that until your episode is published. So did I get on the show? You’ll have to wait to find out, just like I’m doing. Fingers crossed. Have you applied successfully or unsuccessfully to EOFire or any other podcast? If you got on a podcast, what kind of success as an influencer did you get from it? Tell us your story in the comments below! Update: Did I get on? Yes! JLD reached out, we recorded the episode, and here it is! I hope you like it, let me know what you think in the comments below.